Unique and beautiful cards for unique and beautiful people! Since 2000, I've been creating individually hand drawn and painted greetings cards for customers who have an eye for quality and want something totally unique. Over the years my designs have taken pride of place on mantelpieces across the world! As each card is individually illustrated and painted onto quality watercolour card, no two are alike, and can be personalised with any message. I use bright buttons and sparkly stars in many of my designs, for that whimsical and special touch. You really won't find cards like this anywhere else - have a look at my range today and discover what truly personalised cards are all about. I can also create a bespoke design just for you, and offer large cards for groups and special occasions. I strive to provide a beautiful, quality product with a friendly, professional service. Designs can be adapted and created to suit your needs, so let me know if you'd like to make any changes. 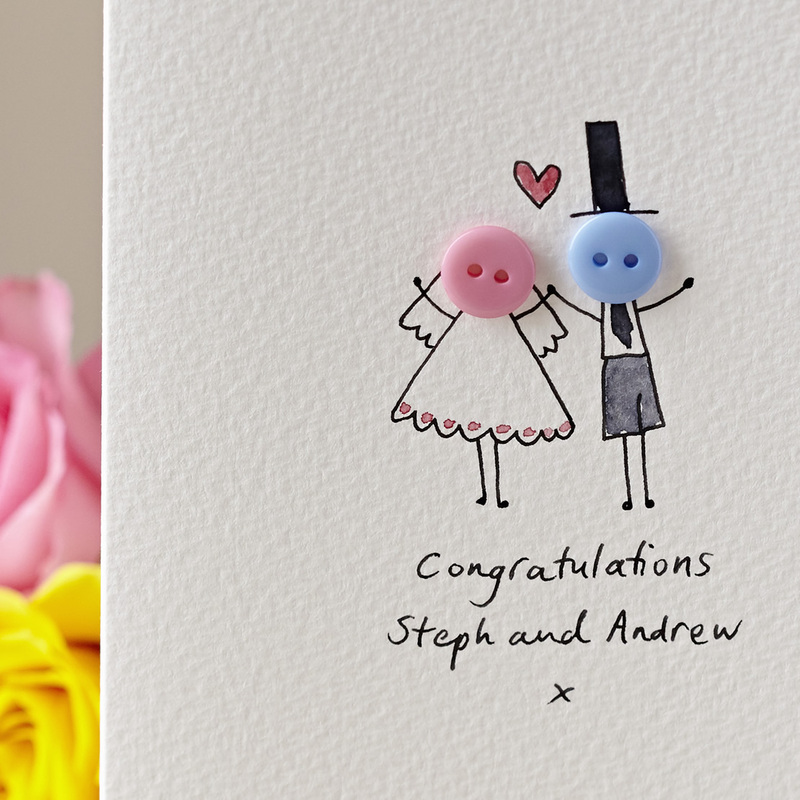 I welcome large orders of cards for wedding stationery, parties and announcements - do get in touch to discuss discounts. "Arrived earlier than expected. Extremely pleased with this lovely card, especially the personalised detail of the kilt in the colours of my nephews wedding kilt. He was delighted with it. Would highly recommend!" "Absolute fab service from Hannah. I had an idea and she pulled it off perfectly, and noticed a flaw with my plan which could have ended in disaster!! Couldn't recommend her enough. Thank you again." "I've purchased one of these cards previously & the recipient loved it therefore it was the first card I thought of when I had the opportunity to purchase another one." "Beautiful card, seller’s customer service went above and beyond re order and delivery, Will buy again, thank you." I aim to get your item to you as soon as possible within 5 days (for mainland UK orders), and when possible orders are posted on the day of purchase. Items are sent via Royal Mail first class post. Orders made before 7pm are guaranteed dispatched next working day with delivery estimate 1-2 working days. They usually arrive the day after dispatch in the UK, but sometimes take longer during busy periods. Please contact me to arrange express delivery. Overseas orders are sent via Royal Mail and will take longer to reach their destination, so please allow 28 days for delivery. All are items are packaged appropriately. All Hannah Shelbourne Designs cards are hand-drawn and painted, which can result in colours and designs varying very slightly from those shown. Personalised messages will be added to the front of the card, beneath the design. Personalised messages must not contain any offensive language. You will be contacted if we have concerns about your message. We reserve the right to refuse your order if we believe your message is offensive, and you will be given a full refund. Our lavender filled hearts are designed for decorative purposes only. Your heart trio will be selected from collection you choose, and fabrics may vary from those shown. However, if you see a favourite heart pictured, please contact us before ordering, and we will do our best to include it on your trio - but cannot promise this as fabrics are sometimes unavailable. We do not recommend hanging hearts near light bulbs or Christmas tree lights, or in direct sunlight. Hearts contain real lavender which should not be consumed. Do not wash your hearts or get them wet. Our button stud earrings are made with low nickel silver plated studs. We recommend that you do not wear our studs if you have experienced allergic reactions to jewellery in the past, just to be sure. Our button stud earrings are not designed to be waterproof. Colours and textures may vary slightly from those shown. Our knitted rosettes are hand knitted and stitched, and some stitching will be visible on the back. Rosettes are designed as fashion brooches and accessories for handbags, but we do not recommend attaching them to leather, suede or plastic. Should you need to wash your rosette in the future, dab gently with a damp cloth. If your rosette needs repairing within the first year of purchase, please return it to us and we will carry out any repairs free of charge. If you have any queries about our products, please email us before you order. Please note that none of our products are suitable for children or babies, and must be kept out of their reach at all times. All character and card designs are copyright Hannah Shelbourne 2000-2011. All are items are packaged appropriately and sent by Royal Mail.